Let’s be honest, self-care is hard work. It’s not just treating yourself to a day at the spa or indulging in an afternoon of ‘me-time.' These are certainly ways of caring for yourself, but self-care goes much deeper. To really take care of YOU, there’s a lot of mental work that has to happen first. Doing this level of work allows for a deeper connection with yourself and enables you to establish a self-care routine that you can maintain on an on going basis. The mental side of self-care is where you lay the foundation upon which you build the practice of self-care. Without doing the mental work first, your self-care practice won’t be strong enough to withstand all the challenges life presents. Simply put, self-care is the practice of taking care of yourself. As an adult, this is your job. It’s no one else’s responsibility to ensure you are cared for, healthy, and happy! While part of this includes things like eating right and not sitting all day long, it also involves going to the doctor, getting enough sleep, and taking some down time. But, the physical realm is only part of self-care. To take it a step further, self-care means taking care of the entire package: physically, mentally, emotionally, and spiritually. It’s easy to limit yourself to just the physical since it’s the most visible. But to really feel the benefits of self-care and to fully optimize who you are, you have to consider all the dimensions. Self-care is looking at all aspects of your life and evaluating what you need to feel whole, healthy, satisfied, and fulfilled. It's about creating an environment where you thrive physically, mentally, emotionally, and spiritually. The key to being your best self is to own your self-worth. Sounds great, right? But what does that actually mean? Owning your self-worth means you know you are worthy of doing what is needed to honor your needs. It means saying ‘no’ so you don’t get overwhelmed. Related Topic: 5 Reasons Why You Need to Say NO! It means taking time for yourself to engage in activities that soothe you, feed you (mind and body), challenge you, and allow you to grow. When you don’t feel worthy, or you feel the needs of others outweigh your own, you can’t adequately take care of yourself (which also means you can’t adequately take care of others either!). The mental side of self-care is doing the work to elevate your sense of self-worth. You have to work on quieting the inner critic that tells you you’re not worthy or to play small in life. You have to explore what you allow to hold yourself back from being a bigger and better you. You have to say no to requests that you either don’t want to do or don’t have time to do. You have to learn to prioritize yourself. 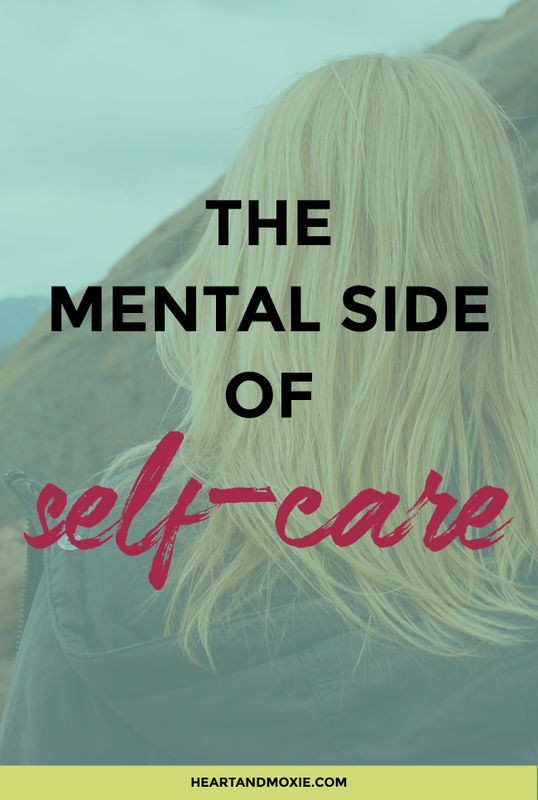 The mental side of self-care means getting in your head and doing a little clean up on all the thoughts, limiting beliefs, and untruths that block you from taking good care of yourself. It’s easy to believe that you are taking care of yourself by getting a manicure, but the real question is how you feel about yourself. Self-care isn’t just about looking good. It’s about the entire package and to fully embrace the job of being CEO of your self-care plan, you have to start in your head. The mental side of self-care is where you lay the foundation to building a better you. Are you up for the challenge? Leave me a comment, send me an email, or sign up for a free 30-minute coffee chat to tell me more!